US crude oil inventories: The API is set to release its weekly inventory report later today, and the market is expecting that US crude oil inventories increased by 3.1MMbbls over the last week, according to a Bloomberg survey. 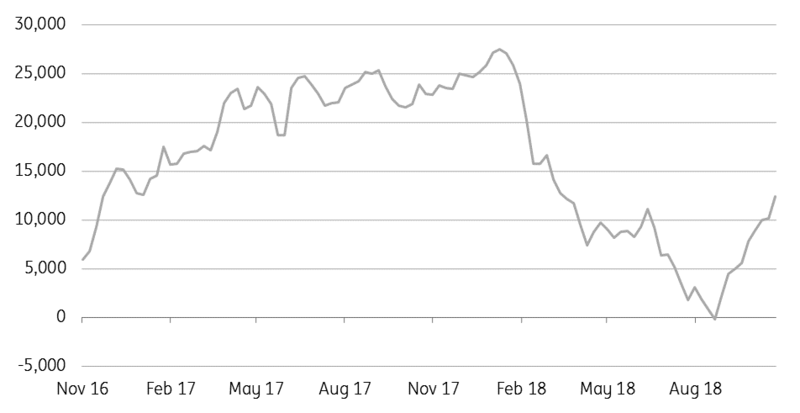 A build in both Cushing and total US crude oil stockpiles over recent weeks has put pressure on the front end of the WTI curve, with spreads through until the May/Jun’19 in contango. For Brent, it is a different story, with just the prompt spread in slight contango. Japanese crude oil imports: Latest Japanese government data shows that crude oil imports from Iran totalled 132Mbbls/d over the month of September, down from a little over 190Mbbls/d in September 2017. The declines appear to reflect concerns over upcoming sanctions on Iran. Japanese buyers will be keen to secure waivers in order to continue buying Iranian crude oil when US sanctions on Iran come into force in early November. However, as of yet, there have been no reports of the US granting waivers. Depreciating yuan pushes metal prices lower: The CNY fell to a decade low of 6.97 today, declining 1.5% so far in the month of October, with continued trade tensions and the threat of further US tariffs on Chinese goods a key concerns for economic growth. A weaker CNY makes it costlier to import metals into China, and so over large parts of this year, there has been quite a strong relationship between a weaker CNY and weaker metal prices. Looking ahead, Chinese manufacturing PMI data will be released tomorrow, and our Chinese economist expects a number of 50.3, down from 50.8 in September. A weak number will do little to support base metal prices. Palladium prices retreat: Palladium prices fell 1.4% yesterday, taking total declines to 4.6% over the past three sessions, following last week’s rally. It does appear that profit-taking by speculators is the primary driver behind the more recent weakness. CFTC data shows that the managed money net position stood at a seven-month high of 12,403 as of 23 October. US grain export inspections: The latest data from the USDA shows that almost 653kt of corn was inspected for export last week, compared to 1.02mt in the previous week. Meanwhile 1.3mt of soybeans were inspected for export, compared to 1.2mt in the previous week. Cumulative export inspections for soybeans so far this season stands at 7.32mt, down from 12.38mt at the same stage last season. US crop progress: The latest crop progress report from the USDA shows that 63% of corn area has been harvested as of 28 October. This compares to 52% at the same stage last year and the five-year average of 63%. Meanwhile, 72% of soybean area has been harvested, lower than the 81% seen at the same stage last year.